THE disaster will be remembered: At the beginning of December, 1930 a thick mist lay over large parts of Belgium. On December 3rd, 4th and 5th several thousand cases of acute pulmonary attacks occurred in the densely populated valley of the Meuse east of Liege, and there were 60 deaths. There was a great stir at the time, and many explanations were advanced as to the cause of the disaster. The Belgian Government voted 250,000 fr. to defray the cost of an investigation (1). A Belgian Commission of Investigation came to the conclusion that the cause was poisonous products in the waste gas of the many factories in the valley, in conjunction with unusual climatic conditions (2, 3). It was impossible to indicate any definite substance or chemical compound as the cause, but the Commission was of the opinion that the disaster in all probability had been brought about by sulfur dioxide (SO2) or oxidation products of that compound, of which quantities were found in the factory smoke. There is no doubt as to the connection between the activity of the factories and the disaster. If I draw attention to this somewhat unusual matter, it is because today we know more about a certain intoxication than was known in 1930. Naturally, it is not possible to give an explanation of the disaster, which is beyond discussion. The event is a thing of the past, and there is no chance of making direct observations. To me, however, it is quite probable that the affection from which these people suffered was an acute intoxication by gaseous fluorine compounds emanating from certain factories in the region concerned. That idea has been advanced before, by Storm van Leeuwen (4), Gram (5) and Fenner (6, 7), but without sufficient grounds to make it acceptable or even generally known. The Commission of Investigation also looked into the question of fluorine intoxication, but without crediting it with more than secondary and at the most doubtful importance. I am in a position, however, to put on record a number of new or hitherto neglected factors. During the days involved a mist lay over the whole of Belgium, but particularly in the Meuse valley, on the 20 km. stretch from Seraing, West of Liege, to Huy which lies midway between Liege and Namur. There the Meuse runs southwest to northeast, in a valley that is no more than 1 or 2 km. wide, but fairly deep (60 to 80 m.). The barometer was high at the time and the weather was cold. During the day the temperature was a little above freezing point, while at night it measured up to 10 below. There was practically no wind, the faint easterly breezes having a maximum strength of 1-3 km. per hour. The smoke from the factories was beaten down and mingled with the fog. The cases of illness began on December 3, after the mist had lasted about 2 days, and some hours after it had attained its maximal density. The cases all began about the same time throughout the entire locality. After December 5 there were no new cases; by December 6 the fog had disappeared. It was estimated that the total number of cases was several thousands. In these three days there were 60 deaths, of which fifty-six were in the east half of the valley and only four west of Engis, which lies almost in the middle of the valley stretch (see fig. 1). Of the deaths, forty-one took place on the north bank and nineteen on the south. The area around Engis was affected most. The chief symptom of the affection was dyspnea, either in the form of asthma-like attacks with labored expiration, or continuous polypnea. In addition, there was coughing, with expectoration, which at first was sometimes frothy, afterwards viscous and slimy. In the fatal cases an acute circulatory insufficiency set in, with rapid and poor pulse, face pale - more rarely cyanotic - and an extension of the cardiac dulness. Stethoscopy of the lungs gave signs of bronchitis, but not of pneumonia (4). Of other symptoms there are records of changes in the tone of the voice, increasing to hoarseness, nausea, occasional vomiting, and lachrymation. Those affected by the fog were elderly people mostly, or people whose lungs or heart were already weak; however, younger individuals, previously quite healthy, were also among those who became seriously ill. Some of those attacked had not left their homes during the foggy days. Cattle became sick in the byres, with the following symptoms: increased and superficial respiration, uneasiness, acute emphysema, cyanosis of the mucous mebranes, sometimes death. Birds and rats also died (8). Very little investigation work was done during the first days of the catastrophe. Ten post-mortem. examinations were made between December 7 and 11. The bodies were found to be in an unusually good state of preservation. Diffuse hyperemia of the mucous membranes was observed in the trachea and in the larger bronchi, and possibily in the larynx as well. Microscopical examination of the tracheal and bronchial mucous membranes revealed local epithelial desquamation, vascular dilatation and degenerative phenomena in the form of defective staining of the cells of the superficial layer. There was practically no bleeding, and only here and there a slight effusion of leucocytes from.the vessels. Numerous particles of soot were found in the lung alveoli and, in addition, microscopy revealed limited areas with moderate edema, hemorrhage, and desquamation of the alveolar epithelium. The other organs betrayed nothing abnormal and the same negative result was arrived at from the spectroscopic examination of the blood and the thorough chemical analyses of blood and organs. The Commission of Investigation therefore concluded that the active agent had been a locally irritant poison without any remote action after absorption. At the time of the disaster the toxicity of fluorine compounds was little known, and accordingly, as far as they were concerned, the Commission could only refer to "a deplorable lacuna in the literature." The last few years, however, have witnessed important contributions towards the elucidation of fluorine intoxication. In chemistry, fluorine is a very active element; many of its compounds have a pronounced ability to form complexes. Biologically, too, its compounds are very active, for besides a local corrosive effect on skin and mucous membranes (attributed to the undissociated hydrofluoric acid-molecule), they have a marked effect on protoplasm, a specific toxic effect, the mechanism of which is only partly known. The possibilities include precipitation of calcium, action on enzymatic processes, combination with albumin. In the period from 1873 to 1935 there occurred in all 112 cases of acute peroral intoxication with sodium fluoride (NaF), sodium fluosilicate (Na2SiF6), hydrofluoric acid (HF) or fluosilicic acid (H2SiF6), and of these 60 were fatal (9). In most ewes the lethal dose is 5 to 15 g. sodium fluoride or sodium fluosilicate, though in some it is as low as 0.2 to 0.7 g. sodium fluosilicate for adults (10, 11). The rate of absorption is very important. The symptoms of intoxication are partly local from the gastro-intestinal tract (vomiting, often sanguinolent, abdominal pains, diarrhea), partly due to absorption: alternate painful spasms and pareses, weakness, thirst, excessive salivation and perspiration. Death usually occurs in a few hours with increasing dyspnea and failing pulse. The face may be pale or cyanotic. Apart from corrosion in the gastro-intestinal tract, the post mortem findings are often small. Microscopic examination may reveal more or less pronounced degeneration phenomena in the parenchymatous organs (particularly liver and kidneys). According to researches by Tappeiner (12), Schulz (13) and Muehlberger (14), dosis minima letalis for mammals commonly used in the laboratory is 0.05 to 0.2 g. sodium fluoride per kg. given perorally. It would thus appear that man is more sensitive to fluorine compounds than other mammals. The effects of gaseous fluorine compounds are known in industry and among chemists working with fluorine. Cameron (15) in 1887 described two fatal cases of acute fluorine poisoning among superphosphate workers, who had spent a brief period in the room where the crude phosphate is stored after treating with sulfuric acid ("the den"). The symptoms were labored respiration, vomiting (once), cyanosis, and death after a few hours. The post-mortem examination revealed edema and hyperemia of the lungs. Analyses showed the presence of fluorine and large quantities of colloidal silicic acid (SiO2), presumably deposited in the bronchi by the decomposition of silicon tetrafluoride. In a German factory working on the electrolytic production of beryllium, Weber and Engelhardt (16) observed dyspnea, cyanosis and general weakness among the workers. Physical examination gave signs of bronchiolitis. The workers were exposed to the effects of hydrogen fluoride and silicon tetrafluoride. Frostad (17) recently described acute fluorine intoxication with symptoms like those of bronchial asthma, and marked effects on the general condition of workers at a Norwegian aluminium factory, where gaseous fluorine compounds emanate from the open melting baths. The few existing experimental investigations, by Ronzani (18), Machle et al. (19, 20), on the effect of gaseous fluorine compounds, confirm the clinical experience. Like other locally irritant gases, hydrogen fluoride causes sneezing, lachrymation and coughing. Death occurs with restlessness and increasing dyspnea. Universal spasms are sometimes present in cases of rapidly progressing intoxication, but are absent in protracted forms. Silicon tetrafluoride has a similar effect (15). Ronzani found that guinea-pigs died after 24 hours' inhalation of 0.03 mg./L. hydrogen fluoride, which was the lowest lethal concentration. The post-mortem findings were acute irritation phenomena in the upper air passages, as well as bronchopneumonia with hemorrhage and edema. No mention is made of changes in other organs. In human experiments, respiration of 0.026 mg./L. hydrogen fluoride was unpleasant, but tolerable for several minutes (19). Prolonged respiration of about 0.01 mg./L. in animals caused emaciation, anemia and organ degeneration besides lung changes (18, 20). Chronic fluorine intoxication has peculiar and very characteristic symptoms which either are localized in the dental and osseus system or are of a more general nature (21). 1. Teeth.- Ingestion of fluorine compounds causes degenerative changes in the teeth or those parts of the teeth which calcify during the period of ingestion. In the mildest cases the enamel is opaque, chalky-white. When more seriously affected there is a dark pigmentation of the enamel and the hardness of the tooth is reduced. The disease is best known as "mottled teeth," which occurs in man in regions where the drinking water contains 1 mg. fluorine per litre or more (22). This dental affection has also been observed in herbivorants, and known as "darmous" (23) and "gaddur" (24). It is readily produced in the rat, whose incisors grow from persistent pulps. 2. Bones.- Fluorine has a peculiar, twofold effect on the osseous system, for we know of both a diffuse osteosclerosis with ligament calcification in cryolite workers (25, 26), and a diffuse affection, resembling osteomalacia, in cattle (27, 24). This osteosclerosis, which so far has been observed only in adult individuals, is in all probability caused by a relatively small dose of fluorine, whereas osteomalacia requires a relatively high one. There is still a good deal of obscurity to be cleared up, however. Under the microscope the bone affection is characterized by an irregular organic matrix and a calcification anomaly, whereby the calcium salts are deposited in the form of granules or lumps. 3. General condition.- In relatively large doses fluorine causes, among other conditions, loss of weight, lower food intake, anemia and certain skin and eye symptoms (coarse, untidy coat; abnormal growth of claws; photophobia and conjunctival secretion). The terminal result is a cachectic condition which may be accompanied by signs of manifest or latent tetany. Postmortem examination reveals more or less pronounced degenerative changes of the parenchymatous organs, including bone marrow. As dental changes in man begin to develop on a daily ingestion of about 0.1 mg./kg., this means that man is much more sensitive to fluorine than the rat when fluorine compounds are administered over a lengthy period. It is of interest in discussing the cause of the Meuse Valley disaster to mention some special forms of fluorine intoxication. When a factory employs raw materials containing fluorine, its waste gases may contain hydrogen fluoride under certain circumstances. If silicates or quartz are present - as is very often the case in practice - there may also be an emanation of silicon tetrafluoride. Humidity of the air -- a partial hydrolysis of silicon tetrafluoride to hydrogen fluoride and fluosilicic acid, and these very active compounds will then be present in atomized form with large surfaces. Their ability to form mist is shared with sulfuric acid and hydrofluric acid, but their toxicity is much greater. These heavy mists disperse only slowly, and therefore are capable of corroding vegetation under circumstances where the air is renewed with difficulty. Damage to plants by fluorine compounds has been described repeatedly from regions axound certain factories in Europe: Superphosphate works 1891-96 (28), 1895 (29), 1896 (30), 1931 (31); aluminium factories 1911-18 (32), 1934 (27), 1936 (33); chemical works 1896 (30), 1902 (34), 1931 (31); copper works 1883 (35); iron foundries 1931 (36); and brickworks 1913 (37). These injuries to plants are not widely known. In the industrial smoke problem, investigators have been interested mostly in the very frequent occurrence of sulfurous waste products (S02, S03), and but little in fluorine. A very similar disease may break out after volcanic eruptions. For many centuries, Iceland has time after time subsequent to eruptions been visited by a bone and tooth disease ("gaddur") among sheep that had eaten grass contaminated by the precipitated ash. The author (24) was able to show in 1934 that this disease is a chronic fluorine intoxication that arises in the same way as the cattle diseases near the aforesaid factories. During the volcanic eruption, gaseous fluorine compounds are ejected and dissolve in the tiny drops of water which condense round the ash particles. Mention is often made of the local irritant effect of the rain of ash, but no human deaths caused by volcanic emanations have been observed with certainty in Iceland. 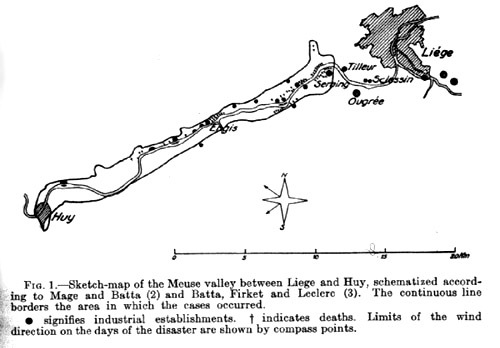 WAS MEUSE VALLEY DISASTER A FLUORINE INTOXICATION? This question requires an analysis of the disaster. (1). The symptoms developed indicate the presence of a very toxic poison that with its actual concentration had a moderate local effect and a pronounced general effect. That the local effect was little pronounced appears from the fact that coughing or the inclination to cough (4), came second to the dyspnea in frequency and importance; that lachrymation was a rare and not pronounced phenomenon (especially prominent round about Engis), and that most frequently the irritation of the larynx caused merely a change in the tone of the voice and no marked hoarseness. The same thing is indicated by the only moderate changes observed in bronchi and lungs at post-mortem examinations. One important fact is that no further deaths occurred as soon as the fog lifted, and that the survivors recovered very quickly in the course of a few days. It is also stated that the symptoms quickly subsided when people ascended the hills surrounding the valley and thus got beyond the fog. The conclusion must be drawn that the poison had a strong general systemic effect after absorption, and that it was a poison the effect of which very rapidly ceased when the supply stopped. Acute failure of the circulation and rapid death also indicate a severe general effect. The meagre result of the necropsies, which were made 3 to 6 days after death, is no more antagonistic to the above opinion than the negative result of the chemical analysis. Microscopic changes in cell protoplasm may be overlooked; the quantitative determination of fluorine is a difficult matter. In explanation of the acute heart weakness the Commission advanced an hypothesis which to me seems insufficient and principally speculative: The diffuse microscopic hemorrhages in the lung tissue were signs of hypertension in the pulmonary circulation; the attacks of asthma caused reduced circulation in the larger stream, with consequent ischemia of the myocardium. Here we must remember that healthy individuals also died, even if their number was small, and that in a large percentage of those attacked (and of the cattle) dyspnea was in the form of continuous polypnea, and not of bronchial asthma. Hemorrhages observed in the lungs were undoubtedly expressive of a local effect, whereas the heart weakness was due to an absorptive toxic effect (the heart? the vessels?). In the signs of intoxication there is no indication that it may not have been an acute fluorine intoxication, but much in favor of that assumption. In glass and pottery manufacturing fluorspar (or cryolite) is often added to the raw material to facilitate melting and to give the finished prduct certain properties. Zinc ore very often contains fluorspar, a phenomenon familiar to technical workers (6). In superphosphate manufacturing the raw material is phosphorite, which contains 3 to 5 per cent fluorine, of which a part is liberated in the form of hydrogen fluoride and silicon tetrafluoride when treated with sulfuric acid. DeEds (43) calculates that in the United States the manufacturing of superphosphate frees 25,000 tons of fluorine a year into the atmosphere. Two facts referred to by the Commission prove that gaseous fluorine compounds were continuously being emitted in the Meuse Valley. Window panes and electric bulbs in the region around Engis lost their gloss more quickly than normally. On the North bank of the river around the same village, damage to the vegetation was a well-known phenomenon, and after grazing a short time the cattle contracted serious bone diseases, as numerous actions at law disclose. One of the main reasons why the Commission rejected fluorine as the cause of the disaster was because gaseous fluorine compounds were, it was said, only emitted at Engis, and on small scale, viz. 200 kg. fluorine per day. If we presuppose an equal diffusion, this means that the maximum fluorine concentration in this valley, measuring roughly 20 km. long, 1 km. wide and 100 m. deep, would be only 0.08 mg./cu. m. fluorine, or a maximum of 0.3 mg./cu. m. in the course of four foggy days. This calculation, however, is open to correction. I am informed (44) that the large iron works at Seraing produce about 460,000 tons of steel per annum. If we take a consumption of 4 kg. fluorspar per average ton (which is the rule), the daily fluorine emanating from these works alone is capable of rising to 3,000 kg. If to this we add the fluorine given off by other large metal works, including the zinc works, and if we take into consideration the fact that the diffusion is not necessarily equal, but that the prolifically mist-forming fluorine compounds may have collected in the bottom of the valley, we arrive at values of the same dimensions as the 30 mg./cu. m. hydrogen fluoride which Ronzani (18) indicates as the lowest lethal concentration for guinea-pigs, and the 26 g./cu. m. which Machle et al. (19) found unpleasant, but tolerable for several minutes to man. On respiring air containing 30 mg./cu. m. hydrogen fluoride, an adult individual will absorb about 0.12 g. fluorine in the course of 8 hours, or a quantity corresponding to the minimum lethal dose in spontaneous peroral intoxication. Thus there is circumstantial evidence that the fluorine concentration in the Meuse valley may have exceeded the lethal dose for man. (3) A consideration of the various circumstances of the disaster will provide additional support for the hypothesis of fluorine intoxication. 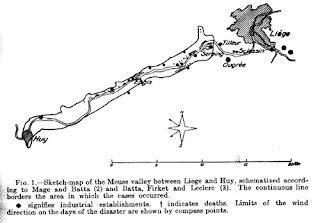 The distribution of the fatal cases, in conjunction with the direction of the wind (prevailing easterly winds), indicates that the toxic agent emanated from two separate areas, one at the fairly wide entrance to the valley in the region Sclessin-Ougree-Tilleur-Seraing, which includes the large metal works, and another in Engis, where zinc and the superphosphate works are situated. Between these two regions was a belt several kilometres wide without deaths, whereas the light easterly winds concentrated the poison southeast of both these regions, and principally along the North bank of the river, against the North wall of the valley. The immense masses of soot and dust emanating from the works have served to promote condensation. Fluorine compounds must have been present in dissolved form in microscopic particles of water and consequently in a very active and easily absorbable form. Many soot particles of a diameter of 0.5-1.35u were found in the lungs of the dead. When the mist rose the ground was covered with a layer of fine soot. During those foggy days every possibility of ventilation must have been closed, vertically and horizontally. In conclusion, mention may be made of other explanations advanced as to the cause of the Meuse Valley disaster. The mist as mist cannot be held responsible; cold fog causes chills, but not rapid lethal intoxication. The fog lay thick all over Belgium, but no sickness occurred elsewhere. An acute lack of oxygen, caused by the emanation of air deficient in oxygen from rock caves or soil layers, cannot explain the disaster: firstly, the intoxication does not resemble acute oxygen lack; and secondly, there could be no such emanation, owing to the high atmospheric pressure. The possibility of carbonic oxide poisoning may be rejected on the basis of the symptoms and the negative result of the blood examination. Possibilities such as poisoning with Sahara sand (45) or sudden epidemic disease through emanations from the soil (46) scarcely call for further examination. The Commission made a careful examination of a large number of waste products from the industrial establishments, and acquitted them all of any complicity; they included carbon dioxide, hydrogen, hydrogen sulfide, arsine, dust of zinc oxide, iron oxide, lime and metal; soot. There is no doubt that the Commission was right in this. As was stated in the Introduction, the Commission arrived at the conclusion that in all probability the disaster was due to poisoning with sulfur dioxide which was discharged by the factories in all parts of the region, or the oxidation product of that compound, sulfuric acid. Without doubt there were considerable quantities of sulfur dioxide present. Through its calculations the Commission arrives at 25 mg./cu.m., or in the course of the four foggy days, 100 mg./cu.m. Assuming the complete oxidation of sulfur dioxide, this corresponds to 38 and 152 mg. sulfuric acid per cu. m. respectively. The just tolerable concentration for sulfur dioxide with protracted respiration is given as being about 25 mg./cu.m. (Flury and Zernik (47)). The mechanism of the toxic action of both these compounds is quite different from that of fluorine compounds, namely, a local effect owing to their acid character, irritation developing into tissue corrosion with the formation of necroses. There is no question of a specific systemic toxic action. The irritation particularly affects the most easily accessible mucous membranes, those of the eye and throat. With stronger or longer action there is inflammation, with hemorrhages in the upper air passags and sanguinolent lung edema. Both compounds may be characterized as being relatively atoxic. Though their occurrence in industry is extremely frequent as compared with that of fluorine compounds, we know of very few cases of poisoning. This is contributed to by the circumstance that inurement is distinctly possible (not observed in the case of gaseous fluorine compounds) and that toxic and dangerous concentrations have a markedly local effect, with lachrymation, coughing, and a characteristic sharp smell and acid taste which present a warning. There seems to be a rather wide difference between the concentration that causes incipient irritation and the dangerous concentration. Only this can explain the great divergencies existing in published accounts -- Dorsch states that 4-8 mg./cu.m. sulfuric acid causes pronounced trouble, and others that 40, indeed from 80-120 mg./cu.m., is scarcely harmful. Workers in sulfite factories tolerate variously from 80-130 mg./cu.m. sulfur dioxide without symptoms of irritation (47). In the Meuse Valley disaster it seems very significant to me that though so many were attacked, it appeared impossible to obtain any clear statement as to whether the mist had any particular smell or taste, and this in a region where the population are presumably familiar with the characteristic smell of sulfur dioxide from transitory, strong discharges. On the other hand, as to fluorine compounds, it must be assumed that in the concentration in question they were relatively odorless and tasteless. Hydrogen fluoride is a weak acid, and silicon tetrafluoride does not seem to have any characteristic smell in low concentrations. A description is given of the mysterious fog disaster which occurred in the Meuse Valley near Liege (Belgium) early in December, 1930, involving several thousands of cases of sickness and 60 deaths. After a survey of acute and chronic fluorine intoxication, an analysis of the details of the disaster gives circumstantial evidence that the malady was acute fluorine intoxication. Of the 27 factories in the region, fifteen are industrial branches which either use raw products containing fluorine (superphosphate works, zinc works) or add fluorine compounds to the raw materials (steel works, iron foundries, glass works), involving the possibility of passing gasseous fluorine compounds (SiF4, HF) into the chimney smoke. Special climatic and topographic conditions played an important role in the development of the disaster. The toxicity of fluorine compounds is considerable, and little known in industry. Factories giving off gaseous fluorine compounds should be required to take measures for their effective removal from chimney smoke. 1. Chem.-Ztg., 55, 138 (1931). 2. Mage, J., and Batta, G.: Resultat de l'expertise judiciare sur la cause des accidents survenus dans la Vallee de la Meuse pendant les brouillards de decembre 1930. Chim. & Ind., 27, 145 E (1932). 3. Batta, G., Firket, J., and Leclerc, E.: Les problemes de pollution de l'atmosphere. G. Thone, Liege, 1933 (pp. 260-327). 4. Van Leeuwen, W. Storm: Die Nebelkatastrophe im Industriegebiet sudlich von Luttich. Munch. med Wchnschr., 78, 49 (1931). 5. Gram, H.C.: Taagekatastrofen i Meusedalen. Ugeskrift f. Laeger, 93, 109 (1931). 6. Fenner, G.: Zur Nebelkatastrophe im Industriegebiet sudlich von Luttich. Chem.-Ztg., 55, 69 (1931). 7. Fenner, G.: Die belgische "Nebelkatastrophe" vom 3/4 Dezember 1930. Med. Welt, p. 1860 (1935). 8. Hanslian, R.: Kampfgase im Todesnebel? Universum, 47, 330 (1931). 9. Roholm, K.: Ueber die akute Fluorvergiftung. Deutsch. Ztschr. f. d. ges. ger. Med., 27, 174 (1936). 10. Dyrenfurth and Kipper, F.: Beitrag zum anatomischen und klinischen Bilde der Fluorvergiftung. Med. Klin., 21, 846 (1925). 11. Gellerstedt, N.: Zur pathologischen Anatomie der akuten Fluornatrium-vergiftung. Deutsch. Ztschr. f. d. ges. ger. Med., 19, 475 (1932). 12. Tappeiner, H.: 2. Mitteilung uber die Wirkungen des Fluornatriums. Arch. f. exp. Path., 27, 108 (1890). 13. Schultz, H.: Untersuchungen uber die Wirkung des Fluornatriums und der Flussaure. Ibid., 25, 326 (1889). 14. Muehlberger, C.W. : Toxicity studies of fluorine insecticides. J. Pharmacol., 39, 246 (1930). 15. Cameron, C.A. : On the toxicity of silicon fluoride. Dublin. J. Med. Sci., 83, 20 (1887). 16. Weber, H.H., and Engelhardt, W.E. : Ueber eine Apparatur zur Erzeugung niedriger Staubkonzentrationen von grosser Konstanz und eine Methode zur mikrogravimetrischen Staubestimmung. Anwendung bei der Untersuchung von Stauben aus der Berylliumgewinnung. Zbl. f. Gewerbehyg., 20, 41 (1933). 17. Frostad, A.W. : Fluorforgiftning hos norske aluminiumsfabrikkarbejdere. Tidskr. f. den norske Laegefor., 56, 179 (1936). 18. Ronzani, E.: Ueber den Einfluss der Einatmungen von reizenden Gasen der Industrien auf die Schutzkrafte des Organismus gegenuber den infektiven Krankheiten. Arch. Hyg., 70, 217 (1909). 19. Machle, W., Thamann, F., Kitzmiller, K., and Cholak, J.: The effect of inhalation of hydrogen fluoride. II. The response following exposure to low concentrations. Ibid., 17, 223 (1935). 20. Machle, W., and Kitzmiller, K.: The effect of inhalation of hydrogen fluoride. II. The response following exposure to low concentrations. Ibid., 17, 223 (1935). 21. Roholm, K.: Fluorvergiftung, eine "neue" Krankheit. Klin. Wchnschr., 15, 1425 (1936). Fluorine Intoxication, a clinical-hygienic study. Copenhagen and London, 1937 (in press). 22. Smith, M.C., Lantz, E.M., and Smith, H.V. : Further studies in mottled enamel. J. Am. Dent. Assoc., 22, 817 (1935). 23. Velu, H.: Le darmous (ou dermes). Arch. Inst. Pasteur d'Algerie, 10, 41 (1932). 24. Roholm, K.: Fluorose der Schafe auf Island nach Vulkanausbruchen? Arch. Tierheilk., 67, 420 (1934). 25. Moller, P.F., and Gudjonsson, S.V. : Massive fluorosis of bones and ligaments. Acta radiol., 13, 269 (1932). 26. Roholm, K.L Fluorvergiftung bei Kryolitharbeitern. Arch. Gewerbepath., 7, 255 (1936). 27. Slagsvold, L.: Fluorforgiftning (with Germand and English summaries). Norsk VeterinaerTidsskr., 46, 2 (1934). 28. Mayrhofer, J.: Ueber Pflanzenbeschadigungen, veranlasst durch den Betriev einer Superphosphatfabrik. Ber. 10. Versamml. bayr. Vertreter angew. Chem., Augsburg, 1891 (p. 127). 29. Rhode, A.: Schadigung von Roggenfeldern, durch die einer Superphosphatfabrik entstromenden. Gase. Ztschr. Pfl. Krankh., 5, 135 (1895). 30. Ost, H.: Untersuchungen von Rauchschaden. Chem. Ztg., 20, 165 (1895). 31. Hupka, E., and Gotze: Zur Frage der Schadlichkeit des Fluors beim Rinde. Deutsch. tierarztl. Wchnschr., 39, 203 (1931). 32. Christiani, H., and Gautier, R.: Le fluor au point de vue de l'hygiene industrielle. Action du fluor sur les animaux. Ann. d'hyg., 3, 210 (1925). 33. Bardelli, P., and Menzani, C.: Richerche sulla fluorosi spontanea dei ruminanti. Ann. d'Igiene, 45, 399 (1935). 34. Fresenius, W.: Zur Nachweis des Fluors in Pflanzenteilen. Ztschr. f. Untersuch. d. Nahr.-u. Genussm., 5, 1035 (1902). 35. Schroder, J. v., and Reuss, C.: Die Beschadigung der Vegetation durch Rauch. Parey, Berlin, 1883 (pp. 98 and 271). 36. Uhlitzsch, H.: Ueber die Schlackenbildung im Kupolofen unter besonderer Berucksichtigung von Flusspat. Stahl u. Eisen, 51, 719 (1931). 37. Wislicenus, H.: Bericht uber die zur Beseitgung von Ziegeleirauchschaden, etc. Jahrb. Berg-u. Huttenwesen Sachsen, 1913 (p. A47). 38. Haubner: Die durch Huttenrauch veranlassten Krankheiten des Rindviehes im Huttenrauchsbezirke der Freiberger Hutten. Arch. Tierheilk., 4, 97 (1878). 39. Bartolucci, A.: Della fluorosi o cachessia fluorica nei bovini. Mod. Zooiat., 23 (Parte scient. ), 194 (1912). 40. Sette, N.: Note sur la fluorose. C.R. Soc. Biol. (Paris) 98, 1094 (1928). 41. Medenbach, F.: Der Flusspat. (Mineral-Gesellschaft m.b.H.) Weilburg, 1934 (p. 134). 42. Meisner, M.: Weltmontanstatistik. Ferdinand Enke, Stuttgart, 1929 (vol. 2, p. 310). 43. DeEds, F.: Chronic fluorine intoxication. Med., 12, 1 (1933). 44. Les industries de Belgique. Rosez, Brussels, 1935 (p. 18). 45. Lambrette, A.: Zur Nebelkatastrophe. Chem.-Ztg., 55, 260 (1931). 46. Wolter, F.: Die Nebelkatastrophe im Maastal sudlich von Luttich. Eine vergleichend-epidemilogische Studie. Klin. Wchnschr., 10, 785 (1931). 47. Flury, F., and Zernik, F.: Schadliche Gase. Springer, Berlin, 1931 (pp. 139-146).